Welcome to Day 5 of the Excy 7-Day Upper Body Workout 10-Minute Challenge where we use Excy as an upper body ergometer (UBE) to double-dip on cardio and strength training. In today’s workout, we use the free Excy Mobile Coaching application to stay on track with intervals set to 30 seconds fast (intense) and 30 seconds slow (recovery). Think of the bear crawl exercise like a modified plank that not only focuses on your upper body and core, but also your legs. If you do this often enough, you’ll soon notice more stability, strength, and power in everything you do—plus a stronger core. 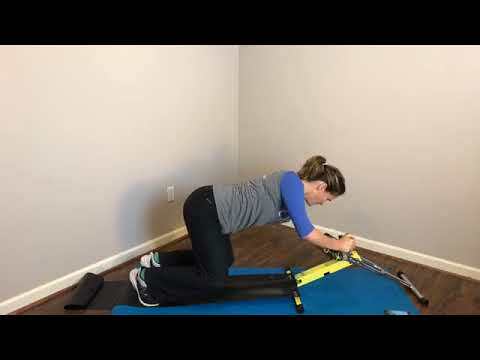 This UBE bear crawl exercise position is one of our hardest workouts for your upper body, but it’s awesome for when you’re short on time and space, but you’re looking for an intense upper body workout that can help simultaneously build strength and muscular endurance in your chest, core, triceps, shoulders and your legs. All you’ll need to complete the Excy bear crawl exercise is an unimpeded floor space about the size of a beach towel, your Excy system and the Excy Keeper. Only attempt this position if you have the athletic ability and strength do pushups, a plank, and can safely hold your body weight. Always consult a doctor before starting a new exercise program. You should never experience pain while using Excy. This is a great article in Muscle & Fitness Magazine on the benefits of proper position of the bear crawl exercise. During today’s workout, we also explore the Excy portable exercise bike system for stationary floor cycling. Excy is super lightweight at 14 pounds, has 2-70 pounds of bi-directional resistance, and is easy to adjust between our upper body and lower body workouts for the ultimate total body workout experience. During the end of the workout, there was some extra time so we opted for a little fun and finished with our Cycle Leg Blast HIIT cycling workout. Have fun!